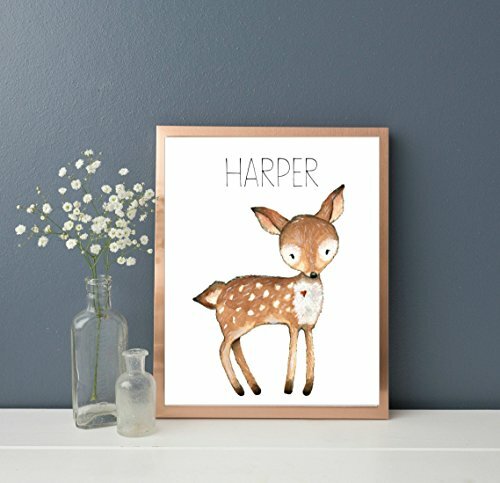 This gorgeous personalized name print features a cute woodland deer personalized for your child and is perfect for your little nature lover to suit a woodland nursery decor style. Children love using their imagination and this print is bright and colorful to provide the perfect visual stimulation whilst adding personality and charm to a room. - One print in your choice of size printed and shipped. - Shipped in a protective clear sleeve with RosaLilla branding in a hardbacked envelope to prevent bending. The print will arrive beautifully packaged in RosaLilla branding. This listing DOES NOT include the frame. The frame is for display purposes only. Shipping in 1-3 days. If you have any questions about this product by RosaLilla, contact us by completing and submitting the form below. If you are looking for a specif part number, please include it with your message.